THIS WEEK’S OTHER FEATURED BOOKS, “MY BROOKLYN WRITER FRIEND,” BY GREG GERKE AND “IN A FAMILY WAY,” BY ZEKE JARVIS, CAN BE FOUND BY SCROLLING DOWN BELOW THIS POST, OR BY CLICKING THE AUTHOR’S NAME ON OUR AUTHORS PAGE. 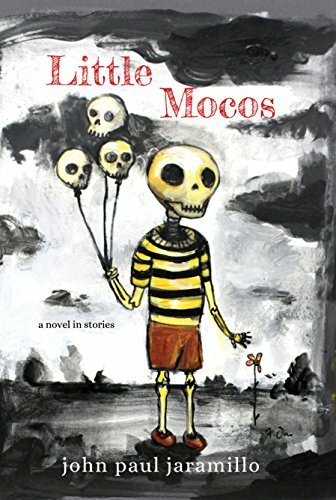 THE BOOK: Little Mocos—a novel in stories. THE AUTHOR: John Paul Jaramillo. THE PUBLISHER: Twelve Winters Press. SUMMARY: Southern Colorado is home to “little mocos” Manito and his cousin Bea, both curious and sensitive, both tragically doomed and longing to live anywhere else. United in their agreement to escape onion fields and Ortiz family ghosts, the two stumble into their teen years with a stubborn brand of bad decisions and petty crimes. Against the cold and gray backdrop of the looming steel mill, Manito and Bea eventually piece together the unbending reality of their multi-generational family trauma, including an unanticipated close connection to local murderer Raymond “Cornbread” Vigil. The Ortiz family stories are minimal and elliptical in Little Mocos and reflect heartbreak and bleakness, but they also mirror strength and resiliency. Manito does not simply recover painful memories from his family; he begins to re-envision them. It is how Manito finds his own way to manhood and a glimpse of life outside of the county of orphans. THE BACK STORY: I’ve been working on this particular book Little Mocos and a grouping of stories for five years, I believe. I have always known my writing process is incredibly slow and meandering. I often say it is a mis-perspective how writers have an ease with words and language, because I feel it is the opposite—writers struggle to capture the right words and structure. I have an idea and I like to give myself the time to follow that idea and see where the language or my thoughts take me. I don’t think I am the kind of writer who just sits and executes the outline, premise or story—I have to take time and find the story arc and premise and find the surprises. I have to think and re-think and find the ideas rather than drive them. Also I think I am the kind of writer that is always looking for the better angle into the story in terms of means of perception. So there are drafts on my computer in third person and first person and just different experiments to find the right way to approach the stories I want to tell. Drafts that include or exclude different characters. Fragments that fail and fragments that succeed. Writing and drafting a book is incredibly difficult, and taming that and coming to terms with that takes a long while. Also an editor friend and mentor of mine Jennifer C. Cornell has given me advice and guidance to tweak the book to the current organization. I always need help and I am always second-guessing the manuscript as well as my choices. I feel as though I work in a way to send stories out to get feedback from editors. So my work is intentionally worked out in bite-size chunks. Also I think I am a minimalist so always trying to do more with less. And most publications or lit websites I admire are looking for short pieces—one needs to be a bit more experienced and known for a novel excerpt I believe. I usually label something a short story rather than a chapter though I believe a chapter and a short story are similar in many ways—they both have a beginning, middle and end. I also seem to float back to the same “universe” of characters and that keeps them together. I often say the material comes how it comes and I follow it. I hear stories or read stories about Colorado and just try and get them re-imagined and down into bite-size chunks for publication. I’ve always advised my students to create relationships with editors who publish similar work and I’ve tried to submit and gather feedback from Latino lit publications to help with revision and these aesthetic choices. I guess simply the label “novel-in-stories” or “composite novel” or even “novella” comes back to the writer’s decisions and style. I mean I’ve always known I have a sort of disjointed sort of style. I have always written smaller stories following the same characters, and I’ve always felt these smaller stories as “complete and autonomous.” Interrelated enough yet at the same time creating a complete whole. Creating a story arc the way a novel would. And I’ve never liked fiction too on-the-nose. I like a rougher feel to the writing. Like punk music or something. But as it comes down to the wire on revisions and I get closer and closer to turning over the manuscript to the publisher I struggle with labeling the work a novel-in-stories, composite novel or just plain stories as well. Making decisions is difficult. The one guiding organizational principle to the book is thematic but also follows the same characters and quite nearly stays in a similar place. The family I am writing about has a family tree that is broken and winding and shattered and so the structure should mirror that. Astillarse, one character describes in the book, or splintered. My book features a composite structure from what Chapter 1 from The Composite Novel— a book I read once by Margaret Dunn and Ann Morris— classifies as the following: Setting—(all my work takes place in the old neighborhood); Protagonist—I follow the Ortiz family; Collective protagonist–the family and neighborhood in different time periods and perspectives; Pattern/patchwork—identical or similarly themed stories focusing on trouble, problems, work/joblessness, etc. WHY THIS TITLE? : Cornbread Vigil is a character based on a man named Ray Baca who is pretty infamous in Colorado—his name appeared in the newspaper quite often. He was a local criminal from my old neighborhood of Pueblo, Colorado, who folks often talked about. Mostly they talked about how they were afraid of him. My Grandfather talked about him since he robbed some local places. He was a person who had multiple crimes attached to him and he was the kind of person who always seemed to get out of trouble—petty crimes and thefts. He became somewhat of a local infamous character but also a weird folk hero/character. In my mind he represents the complex place I was raised and also the moral problem young Latino males or “little mocos” perhaps face growing up. The violent expression that is sometime nurtured. I had so few literary or teacher heroes growing up but my heroes were “around-the-way” kinds of heroes at least when I was very young. I think in much of my writing I try to take these stories from the newspapers and try to imagine or re-imagine them. To try and make sense of them, especially the darker or the more senseless stories. It felt as if this Baca criminal was from the same place I was from and I always found that to be very interesting. He always represented the myths and flavor of Colorado, and I wanted to re-create and re-imagine his story and how it merged with some of my own family. WHY WOULD SOMEONE WANT TO READ IT? I try to create relationships with Latino lit publications—with editors more sympathetic to the use of Spanish in a manuscript. This seems to be a very American issue. I always try to write the way folks talk in Southern Colorado and they speak Spanish and I guess Spanglish would be the term. A blending of Spanish and English—incorrect Spanish and incorrect English. But I have a collection of emails and responses from editors who were pretty aggressive in wanting me to take out the Spanish or to make the stories somewhat of a caricature of how folks speak in Colorado. Perhaps it was my fault for not knowing the publication well enough. There are so few Latino publications. I guess I want to represent but not sell-out anyone from my old neighborhoods. Also though there is a professional dimension where Latinos who speak fluent Spanish will question my decision to omit or to use italics with Spanish in the stories. One writer I admire has Spanish italicized in all of his work and yet criticized me for my decision to italicize in my last publication. The idea being the language is not foreign so one shouldn’t italicize it. Until only recently I have become confident enough to edit what I choose in my own manuscripts and fight for more of my aesthetic choices. I see the whole problem as just working with presses who are sympathetic or understanding of these representation issues or not. I’ve received complaints from some editors and emails from some readers who say I’ve captured the way folks in Colorado speak accurately. So perhaps this is also an issue of representation of place as well as representation of the Spanish language in stories. AUTHOR PROFILE: John Paul Jaramillo was born and raised in the Southern Colorado “Steel City” of Pueblo, CO. He studied composition and literature at the University of Southern Colorado, and at Oregon State University he earned his MFA in creative writing (fiction). Currently, Jaramillo works as Professor of English in the Arts and Humanities Department of Lincoln Land Community College–Springfield, Illinois. His stories have appeared in the Acentos Review, Palabra, A Magazine of Chicano and Latino Literary Art and Somos en Escrito—most recently in La Casita Grande Lounge and Nat Brut #9. He is the author of the story collection The House of Order, named a 2013 Int’l Latino Book Award Finalist, and the novel in stories Little Mocos from Twelve Winters Press. In 2013 Latino Boom: An Anthology of U.S. Latino Literature listed Jaramillo as one of its Top 10 New Latino Authors to Watch andRead. Tio Neto sat on the bed shirtless and hungover, shaking his balding head at the reality of missing his father’s funeral service. He raised both arms to smell his pits and started digging into his jeans for a comb. “There’s a lot of the old folks waiting on you upstairs,” I told him. When he saw who it was, Neto stood up and kicked off his sneakers, coughed and spat at the basement’s concrete floor. He dropped his soiled pants and rolled up in the sheets. “You the only Ortiz worth a damn left alive in this neighborhood,” Neto said. His clothes were in two great big garbage bags, and he stayed still a minute as I dragged his only collared shirt out from under his stash of nudie magazines and fungus-looking weed. I put Neto’s clothes down deep in the washing machine and asked out loud about the whereabouts of my own father. WHERE TO BUY IT: Amazon, Barnes & Noble and Powell’s Books. CONTACT THE AUTHOR: Jaramillo can be found at his site—johnpauljaramillo.com—or on Twitter @johnpjaramillo. Very glad to hear about this writer and his thoughtful approach. I’m sure I’d otherwise have missed him. Many thanks.